After seeing Google Assistant Smart Displays from Lenovo, JBL, LG, and Google, it's now time for another big electronics maker to join the fray: KitchenAid. Wait, what? OK, see, there's a simple explanation: KitchenAid is owned by Whirlpool. No, still doesn't make sense. Well, Ryne called the Lenovo Smart Display "the best new kitchen appliance since the dishwasher" and our best guess is KitchenAid read that and thought, " Nah, we can do better." Alright, all jokes aside, this KitchenAid Smart Display makes sense in a way. Smart Displays have a real sense of purpose in the kitchen: timers, recipes, unit conversions, smart home controls, music while cooking or doing dishes, YouTube videos and tutorials, and a photo slideshow when not in use... If KitchenAid is making appliances for your kitchen, it's not a big leap to imagine it wanting that new potential spot on your countertop. Details on the unit are sparse so far, but the press image shows a lean design, less focus on sound, and possibly no camera. We know it'll have a 10" display, IPX5 water resistance (it's resistant to water splashes and jets, better than JBL's IPX4), use Android Things as its underlying platform, and have "exclusive" extra cooking content from Yummly. It'll let you see personalized recommendations, walk you through the recipe steps, and even includes a Pro tier with video guides. It's this Yummly integration that piques my interest the most. I've been using Yummly on my tablet for over a year to browse, search, and categorize recipes. I love it and I've wanted access to it on my Lenovo Smart Display for a while. (I know I can ask Google Assistant for the recipe and hope to find it from the source site, but I can't browse or add to my Yummly from it). The information we have now seems to indicate that the Yummly service will be exclusive to this KitchenAid display, though I have trouble figuring out how this could be possible if it's using Google Assistant — unless there's a way for manufacturers to customize their units with built-in apps or special content, which we haven't seen so far. I just want a Yummly Actions on Google service like Tasty's on my Smart Display and I'll be happy. One can hope. You can expect the KitchenAid Smart Display to be available in the second half of the year and cost somewhere between $200 and $300. Candy Apple Red KitchenAid Cook Processor ConnectKitchenAid is previewing an addition to its connected offerings with a multi-functional Smart Display with the Google Assistant for home cooks: the KitchenAid® Smart Display. With features such as step-by-step recipe instructions, shopping lists and smart home control, all hands-free for when fingers are covered in dough, the state-of-the-art KitchenAid Smart Display will provide home cooks with a central hub to expand upon their culinary creativity. 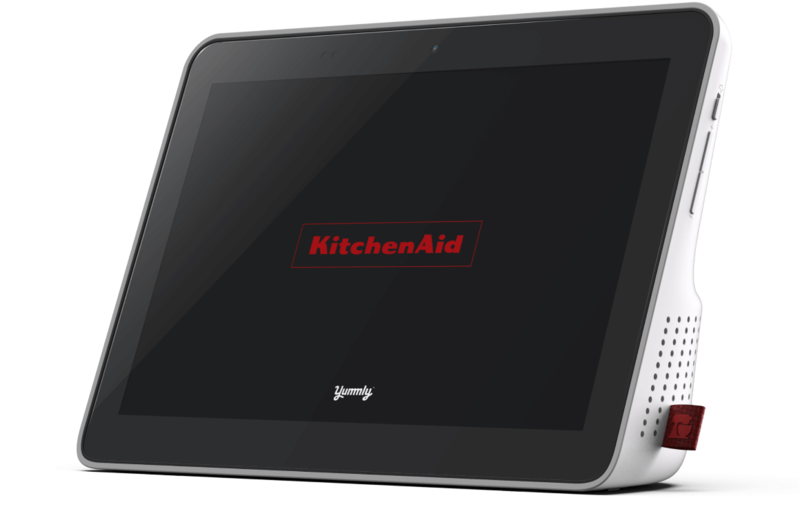 The KitchenAid Smart Display will also feature a 10-inch display for easily viewing your favorite content for the kitchen and more. KitchenAid Smart Display will also be IPX-5 rated for resistance to faucet water, ensuring a worry-free cooking or baking experience and allowing kitchen creatives to fearlessly tackle multi-step recipes and easily wash and clean the device. Manage Everyday Tasks – Stay organized even if your hands are occupied – create a shopping list, make purchases with Google Express, or set timers and reminders. You will also be able to browse recipes and get step-by-step instructions, and get answers powered by Google Search, all hands-free. Enjoy Entertainment – While you’re busy in the kitchen, listen to music, podcasts and radio, or catch up on the latest shows and videos from popular services like YouTube, YouTube TV, Hulu and HBO Now. Yummly Compatibility – From recipe inspiration to videos showcasing guided cooking techniques, Yummly functionality allows makers to feel empowered in the kitchen. Also debuting at CES, Yummly® Pro is a new platform on the Yummly app offering home cooks step-by-step guided video recipe instruction from well-known and influential chefs like Carla Hall, Richard Blais, Jet Tila and Daniel Holzman. Smart Home Control – Smart home connectivity gives home cooks full control over their smart kitchen appliances and entire smart home ecosystem, making it easy to preheat the oven from across the room without missing a beat. KitchenAid Smart Display will be compatible with over 10,000 smart home devices that work with the Google Assistant. From January 8-11, CES® attendees can get up close to all Whirlpool Corporate innovations, including the KitchenAid Smart Display, at booth #41925 in the Smart Home section, located at the Sands Expo Center.